The Barbie fetish has us really laughing (not the Barbie girls though!) 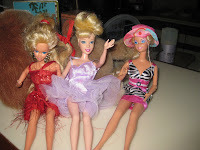 because I have given J. many older Barbies that I have gleaned from second-hand shops. Older Barbies have more movement; their knees bend, their torso sometimes twists around. Newer Barbies tend to be just one plastic piece; boring. The puppy loves the Barbies and chews off their hands and has left several with permanently maimed limbs (click on the photo to see dramatic chews). If you look very, very closely you will see the right hands missing and lots of bite marks on each of these glam dolls. Tarah does not ever choose the variety of Only Hearts club dolls we have. Tarah is only a fan of Barbies and every once in awhile she likes to lick Elizabeth, J. 's A.G. doll. 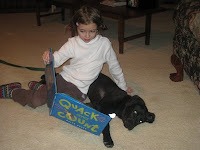 She obviously has her favorites and she is, after all, a girl pup!! What can we expect! J. happily plays with her dolls, with limbs or without...it just doesn't matter. She is non-discriminatory.